Magic Touch Drums Wooden Musical Toy is rated 4.6 out of 5 by 9. You’ll be listening to Mozart in the making as your baby plays and experiments with Baby Einstein and Hape’s Magic Touch Drums. 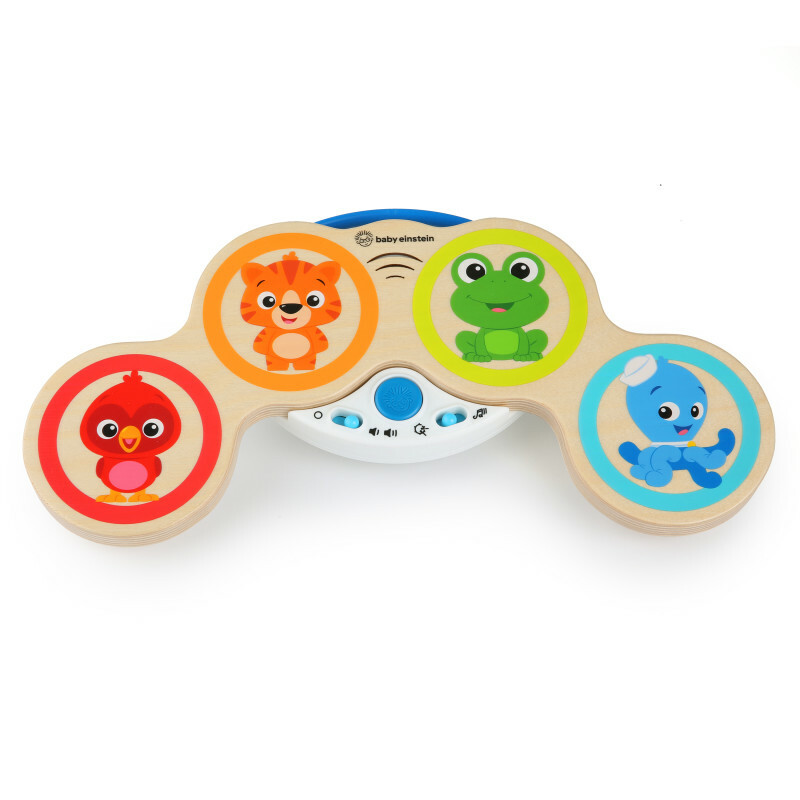 Tap each of Baby Einstein’s friends to play a different note, and magic touch technology means there are no buttons needed! Baby toys that make music will encourage your rock star to think and act creatively. Two different modes mean there are lots of ways your little one can play or start composing his own hit melodies. The toy’s Drum Mode and Melody Mode let baby switch between playing along with classical tunes or moving to his own groove. Get ready to join in – playing the drums is just as fun for baby as it is for you too! And don’t worry about waking little brother or sister. The volume control buttons let you turn the music to “low” when you need to, or crank it up to “high” to rock out. At either volume, the higher end quality speakers make sure your baby’s beats sound just right. Dimension (in) 15" x 8" x 1.75"
Rated 1 out of 5 by ArmyMom from I wanted to love this, but... After having bought one and having to return in less than 30 days because the drums no longer work and the only noise that comes from the speaker is a clicking noise we picked up a second and now after two weeks it's doing the same thing as the first. Sorely disappointed and really loved it and wanted it to be a five star toy but for two different drums to stop working in less than a month is more than a little annoying. Rated 5 out of 5 by Babysteph from Great for toddlers and babies My 7-month old loves laying on the ground in front of it and banging the different animals. She goes crazy when she hits the center blue button which plays a fun (and pleasant-sounding) song. Her four limbs just start flailing with excitement. My toddler loves to make dogs and practice her colors with it, so it’s great for multiple ages. It’s nicely constructed, too. Great gift! Rated 5 out of 5 by Babysteph from Great for toddlers and babies My 7-month old loves laying on the ground in front of it and banging the different animals. She goes crazy when she hits the center blue button which plays a fun (and pleasant-sounding) song. Her four limbs just start flailing with excitement. My toddler loves to make dogs and practice her colors with it, so it's great for multiple ages. It's nicely constructed, too. Great gift! Rated 5 out of 5 by Happy Customer from FUN AND INTERACTIVE My little one enjoys this so much! So bright and colorful and easy to use. I would recommend this toy for sure. We love the wooden toys and this one did not disappoint!! Rated 5 out of 5 by mubbys from Baby Einstein Magic Touch Drums Wooden Musical Toy Baby Einstein Magic Touch Drums Wooden Musical Toy is the cutest toy it keeps babies attention a long time , I love classical music of Mozart I love you have a drum mode and melody mode giving a child lots of variety, You have volume control , baby loves to play the drums also easy to grip onto love heavy duty construction so lasts a long time, bright colors draws babies attention to play with it, easy to take on the go I loved this product love educational toys that uses child's imagination. Rated 5 out of 5 by Melissaca7 from So cute!! Both my kids love this toy!! They both love to try and drum to the music playing and love the cute animals on it too!! Thank you!! Rated 5 out of 5 by Blessedwithmany from Charmingly Soothing I received this sweet little drum in exchange for an honest review & I can honestly say this toy is refreshing! It's not only bright & colorful the drum sounds are a combination of whimsical & earthy for the right balance for both baby (who wants a fun toy) & mama (who wants to encourage brain development but doesn't want "annoying"). My little ones can play on this toy all day & the sounds fit nicely into our home environment without getting on my nerves. I also appreciate that it doesn't take a hard touch to reproduce a sound. In fact you can just hover your hand above each circle & it makes a sound so even a very young baby can play this toy. Press the center blue button to cycle through a variety of different classic music & to change drum sounds. Also some circles make 2 noises as if playing a real drum that would make different tones which makes it more like the real thing. I totally appreciate all the thought into the design & detail of this toy! Very lightweight with a handle for easy packing from room to room. Has 2 sound volumes. Takes 3 double A batteries. If I had to complain about anything it would be that the wood sides are a little hard to clean as they absorb some of the mess as well as the crannies within the switch area. & also there seems to be no recognizable pattern when the drum sound changes. It seems random. But not a deal breaker as the pro's far outweigh the con's! !